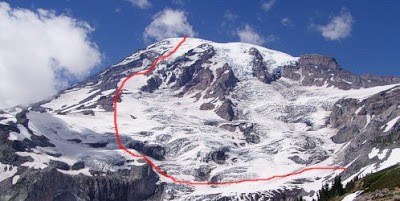 With a couple of pitches of steep climbing, an ascent of a broad glacier, and a bivy at the highest camp on Mount Rainier, the Kautz Glacier is thought to be the premier intermediate route on the mountain. In 1857, August Valentine and his party attempted to make the first recorded ascent of Mount Rainier via the Kautz. Unfortunately the party was turned away before they succeeded. The first documented ascent of the mountain would go to Hazard Stevens and Philemon Beecher Van Trump twelve years later in 1870 after they successfully climbed a line to the southeast of the Kautz. Unconfirmed reports indicate that the Kautz was climbed by seven men and three women in 1913, but little more is known. The Kautz eventually received a documented climb in 1920, when Hans Fuhrer, Heinie Fuhrer, Roger Toll, and Harry Myers summited via the route. 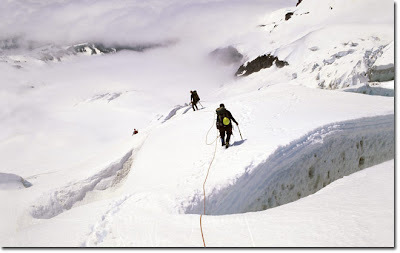 In the early years of guided climbing on Mount Rainier, the Kautz became the standard route to the summit. Over time the line fell out of favor as people migrated toward the easier Disapointment Cleaver route, which is now the standard line of ascent. Unfortunately, this so-called "standard route" on the mountain has become a zoo. Thousands and thousands of climbers ascend the "DC" every year and as a result, the Kautz has reclaimed a bit of its wilderness character. The ascent of the Kautz starts in Paradise. From the parking lot, climbers hike up to Glacier Vista above the Nisqually Glacier. From there you drop down onto the the glacier proper. A short traverse across the lower glacier -- often skirting large crevasses -- brings you to "The Fan," a gully that takes you up off the glacier and onto a ridgeline. The ridge eventually leads to a series of moderate snowfields beneath Camp Hazard, known as "The Turtle." Most climbers will bivy as high as they can on The Turtle for a shorter summit day, often camping as high as 11,000 feet. While there are established camp sites and blue bag receptical bins at Camp Hazard, most climbers avoid this camp. The Kautz ice cliffs above the camp often shed large seracs and the ice-fall danger in the camp is high. On summit day, most climbers will start very early. The short trek up to Camp Hazard must be done quickly to avoid ice-fall. 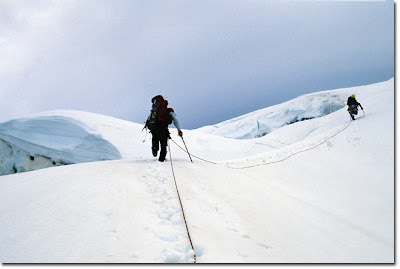 Once at the camp, climbers drop down to the Kautz Glacier proper. There are two steepish pitches of ice climbing below Camp Hazard. Depending on the way that a climber goes, the difficulty can reach up to 60 degrees. Above the ice pitches, the angle decreases significantly. The remainder of the climb to the summit requires standard mountaineering skills. Climbers from around the world come to Rainier because of its beauty and granduer. The Kautz Glacier provides an excellent adventure for those looking for an intermediate level route on one of the most spectacular mountains in the world.